We like to think of our homes as the one place in the world where we feel safe and comfortable. Unfortunately, you’re not the only one who thinks so. Pests love houses because they offer food and protection in unpredictable weather. Here are the main places pests love to hide. Think of your home as a safe haven for rodents who need somewhere to hide in the wintertime. Your house has everything a mouse or rat needs to not only survive but to thrive: warmth, shelter, food, and water. Rodents typically like to nest near a food source, so if you suspect you have an infestation, check your cupboards and behind your fridge. You’ll probably find a small pile of droppings next to a hole. Aside from your kitchen, however, you’ll find rodents just about anywhere in the house, especially since they use the space between your walls as their own private network. Rodents are notorious for squeezing into tiny cracks, so you can never be too meticulous when searching for an outdoor entry point. The reason bats are always linked to vampires is that they share one thing in common: they love the dark. These nocturnal rodents will find a spot on your property that is quiet and promises tons of shade. Because of their size and flying abilities, there aren’t too many places that aren’t accessible to bats, but the most popular hiding spots for bats include the attic, soffits, garages, sheds, and spaces between the walls. You might be wondering how an animal the size of a small dog can be such a cunning squatter, but chalk it up to a raccoon’s extreme intelligence to find a weak spot in your home. Whether climbing high or digging low, raccoons can easily find their way right into your house. They prefer dark and quiet spots away from human reach, so your basement and attic are the first places you should look. In the wild, raccoons like to nest in the hollows of trees. In your home, the chimney most closely resembles their natural habitat. The chimney is most likely where a mother raccoon will keep her babies. 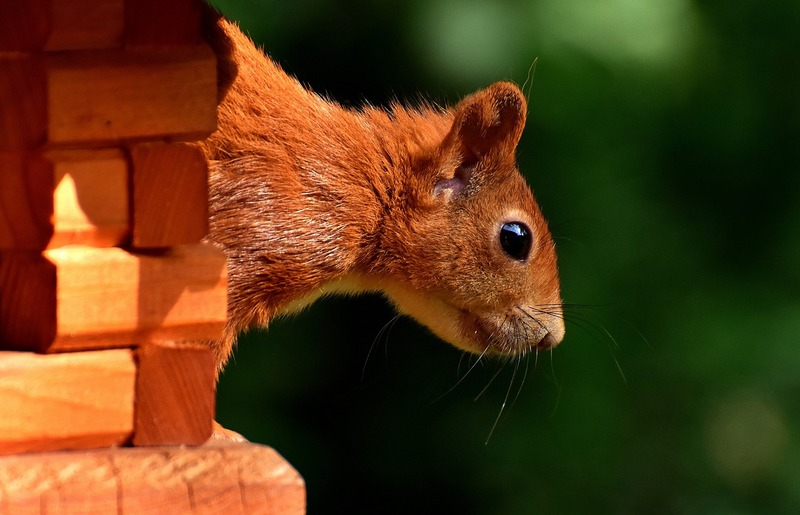 Like mice and rats, squirrels have that annoying ability to chew through just about anything: wood, wires, metal, shingles, etc. What they really love to tear through, however, is the insulation in your attic. They are experts at climbing and jumping from tree to tree, so their entry point may not be as obvious as you might think. Unfortunately, they are also experts at digging their way into homes, so if you start hearing a frantic scurrying above you, you might have a problem. Unless they’re garbage-picking crows, we don’t generally think of birds as pests. But if they get into your house, they can be quite troublesome, even dangerous to our health. Birds like starlings and pigeons can spread disease, so it’s important that if you see a surplus of birds hanging out on your property to check for infestation. Naturally, birds prefer to set their sights on loftier locales like the roof or eaves. If you suspect you have a pest problem, chances are you probably do. Give Raider Wildlife Control a call, and we’ll give your home a thorough inspection.